MINISTRY: Corangamite MP Sarah Henderson. Corangamite MP Sarah Henderson faces increased pressure to secure Comcare for Geelong following her recent parliamentary appointment, according to a federal Labor counterpart. Corio MP Richard Marles urged Ms Henderson to use her position to lobby new Prime Minister Scott Morrison to relocate the public sector insurer. “Geelong has all the required capability and skills needed to accommodate Comcare and it would be a real win for the local economy,” he said. Mr Morrison, who was Treasurer under former leader Malcolm Turnbull, became Australia’s 30th Prime Minister following last Friday’s leadership spill. Ms Henderson was a vocal supporter of Mr Turnbull as Liberal Party conservatives plotted to replace him with Home Affairs Minister Peter Dutton. She rejected a ministry offer from the Dutton camp, she told ABC Radio last week. In a statement last Friday Ms Henderson said she voted against a second leadership spill. 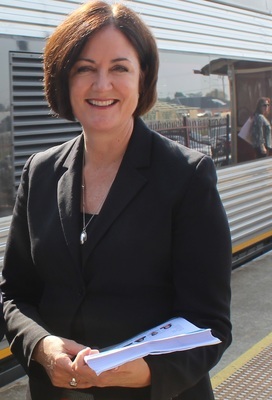 Ms Henderson voted for Mr Morrison when the Liberals narrowly upheld the ballot, after Mr Turnbull pledged to resign if another leadership spill occurred. Ms Henderson’s new appointment as Assistant Minister for Social Services, Housing and Disability Services could increase her influence with the new Prime Minister, Mr Marles said. But he was pessimistic about her ability to secure Comcare or a City Deal for Geelong. “Geelong has been neglected by this government, it was true under Abbott, it was true under Turnbull, I am sure that Sarah will be just as effective under Morrison,“ he said. State Government in May announced $153 million for a Geelong City Deal but the Commonwealth had yet to match the commitment despite it being a federal initiative. Several Geelong delegations to Canberra failed to secure the commitment, which would go towards projects such as a Geelong convention centre. “To make a difference you’ve got to want to make one,” Mr Marles said. But Ms Henderson vowed to hit “the ground running as part of Prime Minister Morrison’s new team”. She met with NDIA executive Maryanne Diamond and Sandy Morrison from Barwon Child Youth & Family in Geelong this week to begin her assistant ministerial duties. “First and foremost, my job is to fiercely and effectively represent the people of Corangamite,” she said. The construction of the $120 million NDIA headquarters and a new ABS National Data Acquisition Centre demonstrated Federal Government’s commitment to Geelong, she said.